Copic released Sketch markers over 15 years ago and with that move they revolutionized fine art markers. The original Copic Marker feels like a nice, solid, firm traditional marker. The Sketch marker came with one end that feels like a brush - A really juicy, flexible brush that never frays and lasts a long time. Finally, here was a marker that didn't feel like a marker, but it would put the high quality Copic inks onto paper in a smooth, paint-like way. 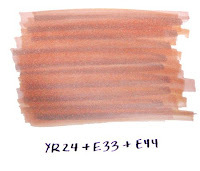 This is what makes the Sketch marker the most popular of all Copic marker types. That's why Japan makes 322 colors of Sketch, and they may even make more (I have some colors I would love to see that Japan doesn't make yet). The other end has a Medium Broad nib, which is a firm chisel tip that is perfect for airbrushing or for coloring large areas. This tip is only slightly smaller than the broad nib nib on a Copic marker. 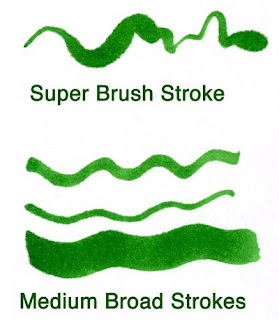 The Sketch marker gives two different patterns when airbrushed. The chisel end gives a fine, smooth spray, the brush end gives a larger speckled pattern. So if you enjoy airbrushing you may prefer this marker over the Copic, even though you'll have to refill this one sooner. If you don't like the chisel nib, then you can swap it out with a Medium Round Nib. This firm round point is great for writing. It's a little larger than the fine point on a Copic, but it is great for people who are used to working with a firm ended marker and want something they can write with that is better than the chisel nib. 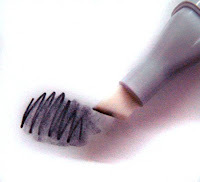 Note that if you remove the chisel then the airbrushing doesn't work the same (more on this when we cover airbrushing). This tip works on either side of a Sketch or Ciao marker. Most of the time I choose Sketch markers because I love how smooth the Super Brush allows me to color. Also, there are so many more colors than any other marker out there that it's hard to beat the selection offered by Sketch. I like how it takes me a while to run one dry, since I tend to be lazy about refilling. If I had only one style to pick, I'd go with Sketch for my everyday coloring needs. The rest of this week I'll be sharing things that relate to comics as well as stamping, in honor of Anime Expo, so stay tuned for a guide to skin colors and more. Enjoy coloring! Before I cover Sketch markers, I want to address a few things that people always ask me, and no matter how many times I answer, someone else will ask me the same thing. Hopefully this will help you with all your questions you've been dying to have answered, or just wondered about. Q. How do I pronounce Copic? Ciao? Spica? A. Copic- long o, Coh-pick Ciao - chow, like the Italian greeting Spica- speek-ah is the Japanese pronunciation and how we say it, but it could be called spike-ah, which is the way Americans pronounce the star of the Virgo constellation it's named after. Q. Which way should I store my Copic markers? Horizontal or Vertical? A. However they look best on your desk :) Japan sells them stored either way, so it doesn't really matter. Q. Will the marker dry out if I don't use it after a while? A. No. We guarantee a 3-year shelf-life. These are very airtight and will last for years, even if you never use them. Q. Are Copic Markers lightfast? A. No. They are a dye. they will fade in harsh light unless they are protected from direct light. Q. What happens if I leave my marker in the hot sun or a freezing car? A. Nothing. They are air tight, alcohol. It will take a lot for them to freeze or boil due to extreme temps. Q. I was coloring away and suddenly my marker blobbed. I've had the marker for a while, what happened? A. The air pressure inside the marker is messed up. Remember, these are very airtight markers. A pressure change from weather, elevation, or my frequent problem is from coloring while flying with the markers. Just pull the cap off both ends and let it sit for a moment. This evens out the air pressure and you should be OK after that. Q. Are Copic Markers acid-free? A. Depending on the surface, they dry acid-free. The alcohol carrier solvent is slightly off-neutral pH, but once that evaporates they are neutral. Some papers retain the alcohol more than others though. Q. One side of my marker seems to be dry. Do I need to refill both sides? A. No. Both nibs share the same ink reservoir. If one side is dry, chances are the other side is almost dry too. Just refill from the chisel end and you'll be fine. I hope you find these little tidbits useful. If you have questions, please ask- send me e-mails at office1@copicmarker.com Have a great weekend! Every now and then I get a question that I think everyone would benefit from the answer. Here's one I got recently. Just so everyone knows, I was NOT planning on posting anything else about the Colorless blender today, I really was going to move on to talking about the differences between markers, but this question just fit in too perfectly with this week's earlier posts. 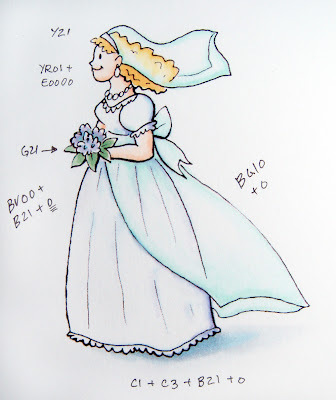 I didn't have a wedding dress stamp, so I drew an example to show you what I mean. First, you need to figure out the feel of the card. What papers are you going to accent with? what do you want it to feel like? 1. What tone of white? Cool, crisp, clean white tends to have a hint of blue, hence adding blueing to a load of white laundry. It makes it look cleaner. So use a super-pale blue or blue violet. bright-B000, muted-BV20, or B40. I'm using a B21 on the final picture since a B000 is a little bright. Or, basically any color that ends in a 0 can be used to achieve some kind of pale tone, so test yours to see what colors work for you and with your other accents. IMO, Blue or blue gray with a hint of violet will still be your best choice for a clean white dress. 2. How do I color it? Ah, now this is the part that makes it look white. Don't color in the whole picture with whatever pale color you chose, since it will not be white anymore. Color only the shadows and edges. Pick a spot for your sun to be shining (I'll explain this better someday), and add your shadows heavier opposite that spot. For these examples, I am having the sun shining from the front, so she'll be slightly more shadowed on the back. Same thing, color only the edges and fade to white. The tricky part is showing things that are under the transparent layer. Her dress and hair are partially covered by a veil. What do we do now? 1. Color the transparent layer with a faint edge of the tone you want. Fade this into white with the colorless blender. I chose BG10 because it has a different feel than the under layer so you can keep the parts distinct in the tutorial. Normally I would choose a blue that would match the dress better. 2. Things under the transparent layer appear one or two shades LIGHTER than they would otherwise. So, whatever color you color the hair or dress, make it even lighter under the veil or train. 3. Don't color all the way to the edge on the under layer- leave some white between it and the over-layer. This really adds to the transparent look. See how I didn't draw the line all the way to the edge? This gives you a visual clue about how see-through it is. I am only going to color where the line is. 4. The transparent layer under the transparent layer will also be colored a shade lighter. Huh? Read it again, slower and it will make sense. Where you see the back of the veil make it lighter than the front edge. 5. The last thing is to add your ground shadows. Areas under the dress are completely shadowed, but she is walking across a white background, so choose a shadow color that ends in 1 or 2. The shadow under her flowing train will be one shade lighter than under her dress because more light is getting through. fade these out with the blender to show how diaphanous the edges are. Bonus: For some extra bling color edges with the clear Spica Glitter pen. It doesn't show up on camera, but that just adds the final subtle, glimmery touch. I have been swamped since I got back from Seattle, so I'm sorry if it's taking me longer to answer e-mails than usual. We are also packing for a large show down in LA that will be happening July 3-6, Anime Expo, so I'm going to also be a bit preoccupied getting ready for that show for the next week, then it's packing for CHA and the Certification Classes in Milwaukee and Chicago. Summer is just sooo busy! Hopefully we'll see some of you this summer at one of our events. Today I wanted to share a quick technique that goes right along with the bricks from Friday. 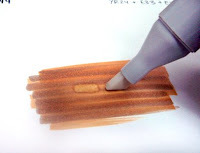 This is a very simple but important trick to keep up your sleeve when you're coloring with Copic markers. One of the qualities of the Colorless blender is that it pushes color- think of pushing your hand through sand and the sand piles up in front of your hand. That's why the bricks worked- it pushed the darker color out from the middle of each brick and made a thick ring around your shape. So how can we use this to our benefit? I could push color around to fix mistakes. 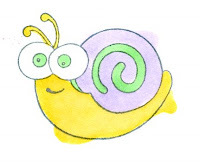 This poor snail was not colored very carefully. I used YG41, BV31, and YR31 and as you can see, the BV and the YR went out of the lines. No worries, this is where my colorless blender comes in to fix my sloppy work. 2. Let it dry and repeat. This step might need to be repeated a few times, but you have to let it dry completely before trying it again, or else the marker will move too much and make a mess of the colored area. When you're doing this trick be sure to keep absorbent scratch paper under your work to catch any stray ink you push around. Also, some colors will be easier to erase than others. After 3 or 4 repeats the YR31 still has a faint trace left, but no where near as bad as before. I can hide this with my ground shadow very easily now, before it would have looked really bad. If you do get a faint ridge inside the stamped line, just color back over the whole area with that same color. This will hide those small mistakes. I'll talk more about the differences between markers next week, when I'm back from Seattle, meanwhile, it's been a few days since I showed a cool technique, so here's a fun one. For those of you who haven't taken a class from me, this is one of my favorite, simple techniques, and is great for making a quick patterned background for a small area. First, start with a streaky colored area. In this case, since I'm going with bricks, I am choosing some orange/browns and layering them sort of randomly, but still all streaks are in the same direction. Why did I streak with a few colors? It adds a pleasing, uneven but similar color to your overall brick pattern. Next, using the chisel end of a colorless blender in any marker style, touch the angled side down and hold it there for a few seconds. The browns will get pushed out in the same shape as the marker tip. If you hold the tip too long in one place the spot will get round and fuzzy, so practice to get the ideal "brick". Good paper will help keep these edges crisp as well. Be sure to lay your bricks in the direction of the streaks, so you'll get more of a consistent color to your bricks. Remember, in good brick-mason style to stagger your rows of bricks. Also, the colorless blender will make lighter colored bricks. 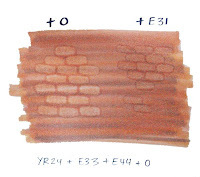 If you want darker bricks, then try a color that is similar to the colors you first streaked with, but still a few numbers lighter on the last digit. This assures that you're pushing out the color already on your paper. If you use a dark color it just covers up your pretty undercolor. See how the E31 leaves more muted bricks than the blender? Either one looks good though. Make an occasional brick darker for even more artistic effect. 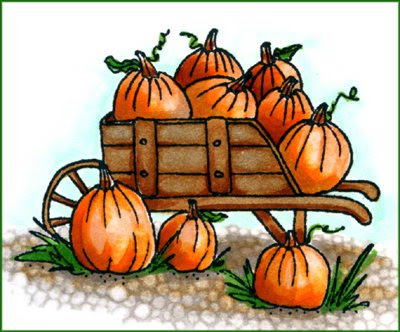 This technique can get tedious over large areas, but it is great when used for a limited background, or if you want to make a brick path, house, or other element of a larger picture. Debbie Olson sort of used this technique to add bricks to a Thomas Kincade stamp by Cornish Heritage Farms once (sorry, it was a while ago or else I could give you a link). 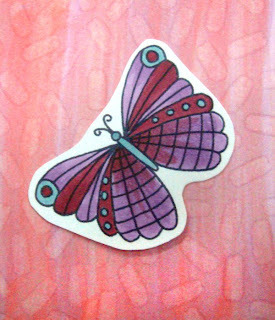 The background for this butterfly stamp was colored in the same manner, except I used an assortment of streaky pinks/light purples to make my base coat (R22, RV11, V12, V01 and maybe a few others). Then I used the blender pen in a random pattern to give a confetti look to the streaks. Experiment with different color combos, and holding the chisel tip at different angles to get different patterns. Want a woven sweater? Use the point of the chisel for an even finer effect and layer it in the same way. 1. White Out- No way should you color over white-out. Besides looking bad on paper it leaves a white spot on the marker tip. the photo shows how coloring over white out shows up worse than ever, and it can leave gunk on your marker tip. 2. Unfired Clay- this will discolor the tip because bits of clay are clogging the fibers. Also avoid plaster. Clay coated papers also should be tested, some will work and some won't. What is OK: Ceramic paint-it-yourself ornaments are great. Sculpey, after it's baked looks real neat. Glazed Ceramics are Ok too, though those are pretty slick surfaces. 3. Acrylic paints- You can get away with some quick work but if you try to color over most acrylics they will clog your marker tips/discolor your tips. 4. Chalks/Oil Pastels- Nope. 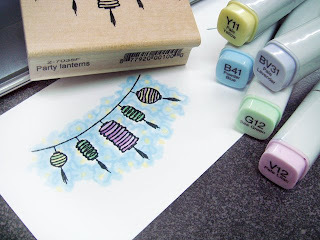 Do these after you color with marker, not before. 5. 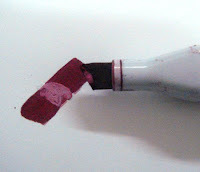 Untested stamping inks- These will stain you tips and it may come back off when you least expect it. See the post on Testing stamping inks for more info on how to throughly test an ink. 6. 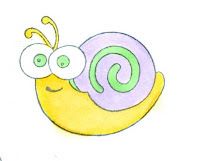 Solvents or oils: These are just a bad idea to color over. They are fine to use over the top of your marker drawing though, and won't hurt it unless they contain Alcohol, Ethanol, or some other similar chemical. Rule of thumb- If it is something that when it gets wet it smears and is opaque, STAY AWAY or test it first. 2. Watercolors- These are so thin that you usually won't have a problem, but they might discolor the tip. 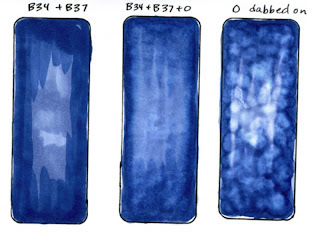 If you want to use watercolors, use them AFTER you use markers. 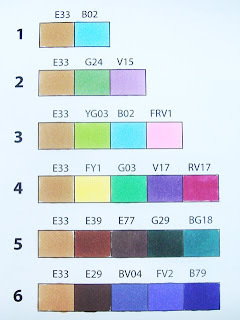 Rule of thumb: In Japan Copic markers are commonly used with watercolors, pastels, colored pencil, acrylics. However, they use them AFTER the marker work has been done. Also, any other inks that are not allowed to dry enough that usually work with Copics will discolor the tips. Your pale colors will show damage the most. It's easy to switch out a tip if you have ruined it beyond help. Get a pair of tweezers (Copic tweezers have little gripping teeth that make removal easier) and pull the tip straight out. Then, insert the new tip by pushing it straight in where the old tip was. Let the marker sit for a few minutes so the ink flows evenly. This is not a complete list, but I am hoping that if any of you have run into other marker no-no's you can share these with us. Oh I'm going to have so much fun papercrafting today! 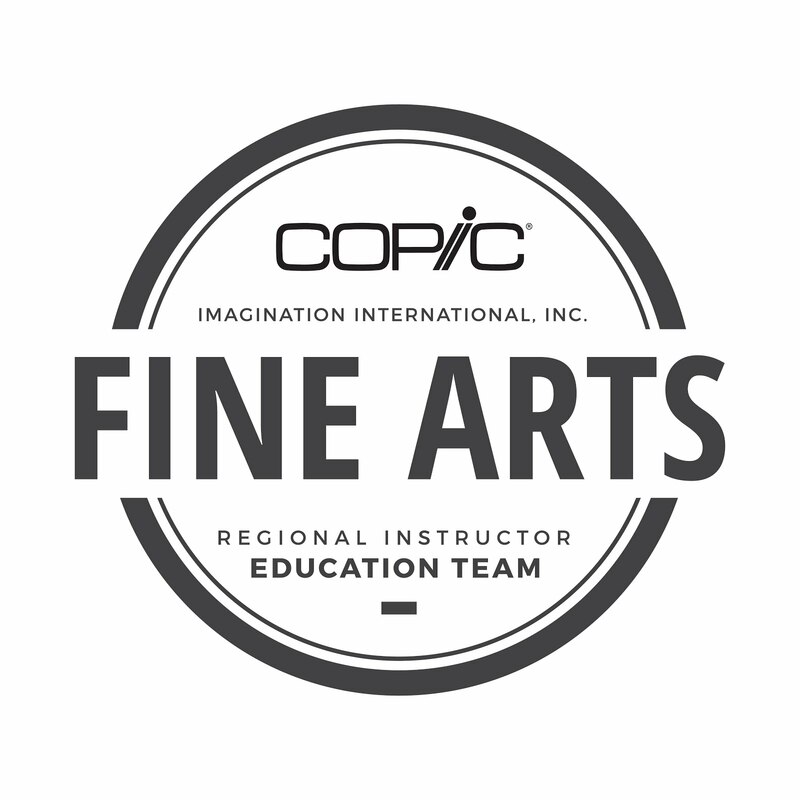 Usually I come up to Seattle each spring for the SakuraCon Anime Convention and teach Copic workshops, but this year I was too busy so everyone else went instead. I love Seattle and I really missed all my Anime friends, but I'm getting to play with stampers, so it all works out. The first marker type I'd like to explain is the original Copic Marker. For those of you who want a firm, fine point while coloring, the ability to airbrush, or don't want to refill right away then the Original Copic Marker is for you. 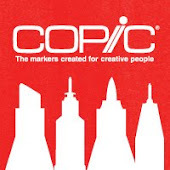 Original Copic Markers were the first style created by Japan over 25 years ago. They are most popular for Architects, product designers, calligraphers, Quilters, and for papercrafting. These durable markers have not changed since they first came out many years ago. Some artists have kept the same marker for over 20 years! These markers feature a square body design, come in 216 colors, and have the option of 9 different tips. If you don't like the standard fine or broad tips then swap them out for calligraphy tips, a brush tip, super fine tip, round nib, or any of the other custom nibs. What does all this mean? The original Copic Marker is the most customizable. You can get an empty marker and mix your own inks to get exactly the color you want, as well as the tips you need. I use these when I have a larger area that I want to color smoothly, and I also need to fill in fine details. One feature people like is that when you take a cap off it can stick on the other side, (you can't do this with a sketch, but you can with a Ciao) and the color number is printed on the cap (not Ciao). The Fine nib is also much easier to write with than the Super Brush tip found on Sketch or Ciao markers. So if you think you'll be doing a lot of journaling with the markers instead of inking pens, then the original Copic marker is for you. Papertrey Ink Stamper's Select: This was by far the most popular paper for working with Copics. This is a very high quality, heavy cardstock with good blendability. Georgia Pacific Cardstock: This inexpensive cardstock is easy to find, with decent blending qualities. SU! Whisper White: Many of you voted for this paper, although it is not a matte cardstock. It is coated, and some of the comments noted that it is good for single-layer coloring, but not as good for blending. Neenah Classic Crest Solar White: This cardstock is not as easy to find, but it is a good, high quality cardstock. I use this kind the most, because we also use it for printing on in the office. 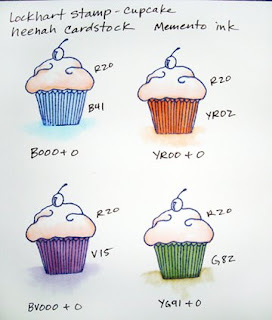 If you ever get a new type of ink or cardstock remember to try the steps I outlined to find out if these will work for you. Note that some inks work better on some cardstocks than others, so test BOTH the paper and the ink. Certification- Tomorrow I'll be leaving for Seattle. These classes will be a blast! I am so looking forward to meeting all of you fun stampers and hopefully I'll be able to share some useful things with you. 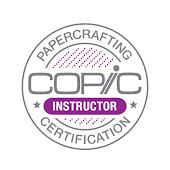 I will try to keep updates on future Certification Classes posted regularly, so keep watching. I found a forum on SCS started by people attending my classes- everyone is so excited! Love your blog! Through trial and error (and error, and error, and error), I've found that Neenah & PTI work the best for me in terms of paper - there is minimal feathering, and good blendability. For ink, I've had the best results with Brillance pigment ink, Palette hybrid ink, and Memento ink. Suzie, if you could please e-mail me your address I can send you out your fun prize! I want to again thank everyone for helping. Monday I'll post the rest of the paper/ink results. OK, enough of you wanted to know how I drew the picture in this morning's post. Here is my typical process whenever I draw anything. Smooth, tight paper. I used color laser copier paper and started with a rough pencil sketch. Pencil. I draw very lightly with a blunt pencil so it erases cleaner. Erase with a soft eraser, holding the paper on one edge and carefully erasing in smooth even strokes (no scrubbing back and forth). This keeps the paper and ink lines from getting ripped. Ink. I ink over my pencil lines with a Copic Multiliner 0.1 mm. For thicker lines I will grab a slightly larger pen, or just go over the line twice. Photocopy before I color. In this case I scanned it into my computer, because I didn't know what size I'd like to color it. 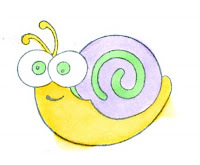 Sometimes I touch it up in Photoshop if I need to fix stray lines or pencil that wasn't erased. Then I printed it at a couple sizes and chose one I liked. Choose Colors. In this case my color palette was chosen by the color rules for E33. 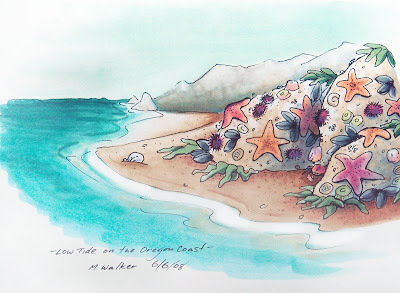 Otherwise I would choose colors that matched real sand/nature better (E42, W3, etc.). Many times I go digging on the internet to look at a photo and see what colors will be in real life. For the plaid on yesterday's card I watched the video of the Monty Python skit and worked from there. If you want to try coloring this picture, go for it, just note where you got the picture from. Send me a link of your colored copy. Today is the last day to add a comment to Tuesday's post. Tonight at midnight I'll tally up the winner and post next week what the favorite paper/ink combos are. Finally, I'm starting my Color Spotlight feature. Every week or so I'll showcase a different color and give ideas of color combos that will work with it. Please note: When I mention a color combo whatever color I put first is the color I put down as my base color, then I blend in the second color. So E33 + G85, the G85 was layered over the E33. Story behind E33: This was among the first colors Japan created over 20 years ago. This is a good, multipurpose middle/light warm brown, and one of our best-selling browns (that's not a skin color). 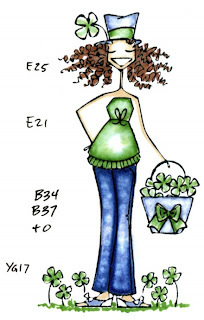 Sometimes I get tired of coloring other people's beautiful stamps, so here's a pic I drew to feature E33. 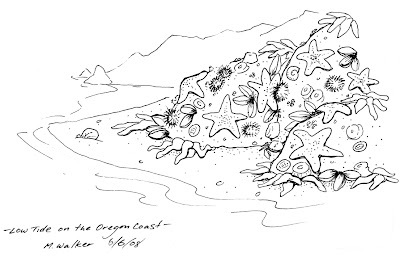 I have always loved the coast, and it's hard for me to forget my Marine Biology teacher when I think of sand, so we get a vibrant low-tide drawing today. To show you how you can incorporate the swatches for E33, I tried to use mostly colors or color families found in the above rules, plus a couple extra that it's hard to live without, like the colorless blender and B000 :). These colors make the picture a bit brighter than a real beach scene, but that's OK. BTW, I compared the color E33 to sand from my son's sandbox. 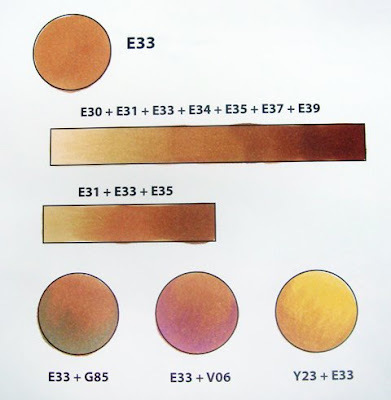 A more accurate sand color would be E43 with a little W3 layered over it to tone it down.